Fuel Consumption Converter is an application for fast conversion between US, imperial and metric fuel consumption units. 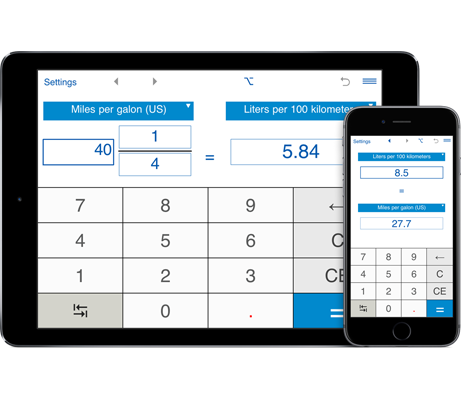 You can use the fuel consumption converter to convert between US, imperial and metric volume units. For example, you could convert Miles Per Gallon (MPG) to Litres per 100 Kilometres (l/100 km), km/l to l/100 km, etc. With he Flip button (two arrows in the bottom left corner) you can easily switch between the "from" and "to" volume units. You can input fractional values. Fuel consumption converter supports rounding to the specified number of decimal places. By default, the app displays 2 decimal places. For fractions, you can round results to the nearest 1/2, 1/4, 1/8, 1/16, 1/32, 1/64, 1/128, 1/256. If you do not need to round fractions, just select "-" in the Settings window.